Some time ago, Natasha and I decided we wanted to read more Native American literature. 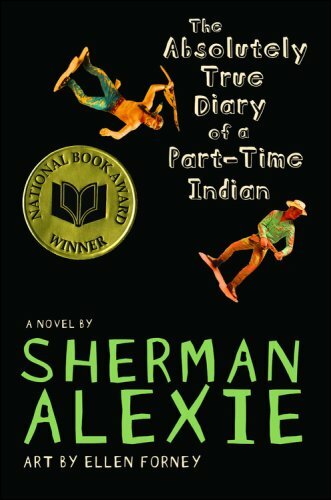 The first book we read together was Sherman Alexie's fabulous The Absolutely True Diary of a Part-Time Indian. The next book we are reading is Bury My Heart at Wounded Knee, which we just recently found out is not by a Native American, but we want to read it, anyway. Native Americans have been silenced and shut away for centuries in America, and Natasha and I are really excited to learn more about the culture. 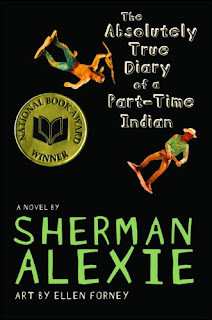 We also became complete Sherman Alexie fangirls after reading this book. The Absolutely True Diary of a Part-Time Indian is a young adult book set in Washington state on a Spokane Indian reservation. Junior, a 14-year-old with a stutter and a brain condition, goes to geometry class on his first day of school and notices that his textbook is the same one that his mother used when she learned geometry. His book is thirty years old, at least. He gets so angry at this fact that he throws the book at his teacher and gets suspended. This leads to him deciding that he will never get off the reservation or make anything of himself unless he gets a good education. Junior decides to enroll in a neighboring all-white school. His new classmates are not overly welcoming and his old friends think he has betrayed his Indian culture. Junior has to find a way to keep his identity and follow his dreams. We reference a certain interview fairly often in our conversation below, so here is a link (to my alma mater!) that has the full text of the interview. The first half of this review is on Natasha's blog, so check that out first! I am in the blue text below, and Natasha is in black. (cont'd) I think Alexie does a great job of exploring this idea without getting caught in the trappings of cliche because he really just brushes on the idea- Junior doesn't feel angst-ridden and he doesn't spend pages and pages talking about how attending an all-white school makes him less of a Native American- he just does it and deals with the fall-out in his own way. I think that's how most people deal with things, personally. Not many kids spend time worrying about losing their culture- they're trying too hard to fit in and find a place for themselves in the world. The whole "cultural identity" thing only really comes later. I think Alexie was true to that. And I liked what he mentioned in the interview about white people writing about Native Americans being "colonial," and that it's a valid way of writing, but should be discussed in context. Really, at this point, I'm just a big Alexie fan! I want to read everything he's ever written! I think you're right about cultural identity being something that sometimes is thought of later. Junior knew he couldn't forget who he was (and people weren't going to let him) but he knew that he had to fit in and that's where Gordy comes in, helping Junior to learn how to really study. Junior's journey would have been so much harder academically and emotionally if Gordy wasn't there to help. Especially considering that in real life, Alexie stated in the interview that he's the first and only person in his family to graduate from college. How horrible. Yes, that struck me, too! He seems to have lifted himself up with almost no support. Though perhaps he had emotional support, but just not a mentor? It made me sad when I was reading the interview and Alexie said how there isn't an Indian Emily Dickinson or Walt Whitman or Shakespeare. It saddens me, too, though, that he chose those three to compare Native Americans with. All white and Anglo-American. As though Native Americans always have to compare themselves with the "colonials," and not just on their own merit, or the merits of other culture. Though really... considering how decimated the population is and that there are so many problems on the reservations themselves, it seems so unlikely that anything will change for the better, doesn't it? I think when Alexie compared Native Americans to "colonials", he was saying how there's not the equivalent in Native American culture and I think that's true. There are a few well-known N.A. authors but not many. Right, I think that is true of many indigenous races- the Aborigines in Australia, many tribes in Africa and, to a lesser extent, the Maori in New Zealand. It is so sad that the entire collective wisdom of so many people can be lost to the extent that it has. Have you read the book 1491? It touches on that a bit- about how much loss the world has suffered in terms of culture and art and innovation due to the wipe-out of Native Americans. I highly recommend that book! When I think of well-known N.A. authors, the first people that comes to mind are Alexie himself, Ai, and David Truer. N.A. are the indigenous people of America but they're almost an invisible race. It's says something when Alexie said in the interview that Native Americans are "30-40 generations behind in writing". Yes, that was startling. And depressing. But a lot to think about. I'm hopeful that things will get better. I know there's organizations like Habitat for Humanity that are trying to make reservations more liveable. But I don't know. Alexie did say that reservations were a kind of concentration camp. It would probably take N.A. moving off of these lands but that would mean a drastic change in culture. This is such a difficult and complex problem. We definitely need to read more things by Alexie. Oh I want to read this! Now twice as bad. Thanks for the awesome review. I liked The Absolutely True Story of a Part-Time Indian, but I think I might have liked his Flight just a little bit better. It's pretty intense, though. This sounds like a great book. The title alone made me curious, but as the actual reading can be dissapointing however great the title is, I'm glad you really enjoyed the book as well! It's now added to my wishlist. This sounds like a really fantastic book. I've always thought that the Native American Culture seemed particularly interesting, and I used to read a lot about it when I was younger. I now really want to give this book a try. Thanks for letting me know about it! I love back and forth posts like this! This was super fun, and now I'm feeling that I also need to read more native american literature. I thought this book was wonderful! It's such a great combination of funny, poignant, informative and more! I haven't read his other stuff yet though. Sounds like an interesting read, with a unique perspective. I'd be interested to read it just to hear to difference between the First Nations experience in America and Canada. We're certainly starting to see a lot more fiction from First Nations writers here - I'd particularly recommend Three Day Road by Joseph Boyden, who is part Metis. I absolutely loved this book. But I tried and put down two other Alexie books - bitter and tragic and no comic relief, as with this one. I have heard good things about Alexie's books, and have been wanting to read one, and this sounds like the perfect place to start. I have read very little literature about the Native Americans, and I consider it a huge gap in my reading. Good to know you guys loved this one so much. It's going on my wish list. Great joint review! Sorry the first half isn't up yet! Pam- Yes, it IS awesome! I think you'll like it. lesbrary- I want to read more by him, so I'll keep your recommendation in mind. Iris- Yes, I thought it was excellent! Fredegonde- Now is definitely the time! brizmus- Yes, joint posts are great! Helen- Neither have I, but I want to for sure! Claire- Thank you for the recommendation. We will look into it! rhapsod- Oh, sad. I think I want to try more of him, but I'll keep that in mind. I really want to read this book now after seeing your comments on it! Since you two liked Alexie so much, I have two recommendations for you (and they both happen to be about First Nations tribes)...Monkey Beach, by Eden Robinson and another Joseph Boyden book, Through Black Spruce. The interview you link to is incredible! So many great points. I really want to read this now! I just bought a copy of this on the weekend, so was particularly pleased to hear your thoughts on it now. Quite looking forward to the read! I want to be a Sherman Alexie fun girl too and I haven't read anything yet. You sold it to me with this post! The first Native American writers who come to my mind Are Susan Power and Linda Hogan. Both are wonderful! You and Aarti might both enjoy the Grass Dancers by Power, and the novels Power, and Mean Spirit by Hogan. softdrink- THANK YOU! We've been looking for other books to read! Buried in Print- Awesome! I hope you enjoy it and I look forward to your review. Vivienne- Come join the cool crew! Trapunto- Thanks for your recommendations, too. I will look into all those people gave me! What perfect timing! I am so glad you reviewed this because I have been on the lookout for another Alexie book, and this sounds wonderful. I think I need to make a trip to the bookstore... now. I've had this on my wishlist forever. I need to commit! I am so glad we thought of doing this together. @Vasilly-I'm so glad you and Aarti are doing this together too! It's such fun to read. Also, perhaps try Blessing's Bead by Debby Dahl Edwardson. It's middle grade so you may not want to read it. But it's set in Alaska, about the Yupnik people during the 1800s. It was sad. She- How funny, I went to the bookstore today and picked up The Lone Ranger and Tonto Fistfight in Heaven so we are on the same wavelength. Lenore- DEFINITELY read it, especially as you are a YA fan! Vasilly- Me, too! I am loving it, and am so excited to read more. Miss Attitude- I'm glad you enjoy it. That part of the interview struck me, too. It makes me so sad that all these POC have terminology for people who are "white on the inside," as though a person can only be one culture at one time, rather than a combination of cultures. I don't see why it has to be so (no pun intended) black and white. Thank you for the book recommendations. This has been a great post for getting my wish list out of control again! I so need to get my hands on this. And on 1491, which I hadn't heard of before and sounds amazing. You two should totally read Monkey Beach by Eden Robinson for this project. It's one of my all-time favourite books. I read this for book club a few months ago. It was so wonderful! I want to read everything by Alexie I can get my hands on. On a side note, last year when all the e-book controversy was starting up, I know he was an author who came out on the side of printed books, because he said if he had not had the library, he never would have gotten out of poverty. So sad. This was a really cool dicsussion and Alexie absolutely sounds like an author I want to read everything by. I have almost no understanding of what a reservation is like (I could pull the Brit card, but really it's just another subject I'd know more about if I applied myself to reading up). Coleen's GuysLitWire project really opened my eyes to the struggles of education on a reservation and how many teachers are trying, but simply don't have the resources. Can't wait to see what you pick up next for this reading project. Alexie's books have got really good reviews. This sounds a really good book as it highlights issues/facts hitherto not very well known. Nymeth- 1491 is one of my favorite history books. It really got rid of many misconceptions I had previously. eveningreader- I agree! You can be a fangirl, too :-) I am with him about printed books, too, though I agree it's sad how he phrased that. Jodie- The GuysLitWire really opened my eyes to it, too. I always knew reservations were pretty horrible places, but in a very off-hands way. Now... well, it's still off-hands, but I hope by learning more I can just understand things better. Mystica- Thanks for visiting! And yes, it definitely highlights a lot of things that don't get much attention. As I commented on Vasilly's blog's part of this discussion, I've read "Absolutely True Diary..." and a couple of his short story collections -- and want to read more. When we were traveling through the Southwest on our recent spring break road trip, we saw a lot of Native-americans, trailer parks, etc. It brought up a lot of questions by my older son -- I should give him this book to read (he's 14). Incidentally, I read the interview and Alexie mentions his being in that 1996 Granta magazine issue. That's the very same one I mentioned picking up as a used book find recently! I did notice he was in there. I'm going to be sure to pull it out of my TBR soon! If you want to read some Native American poetry, I recently heard some good things about Sherwin Bitsui. Apparently Sherman Alexie thinks very highly of him. I've been really interested in Native American culture and history since I visited the States over 10 years ago but never managed to read anything substantial. This book seems to have garnered great reviews and I can't wait to read it. Thanks for posting the link to the interview.